After release the C.K Magma Test Equipment Case, C.K Tools has launched another first, the C.K Magma Test Equipment Case Toolkit. The toolkit is designed to offer a complete solution to electricians, featuring all the tools a tradesperson would require during the diagnostic test phase and final certification tests, all held together in one efficient case. 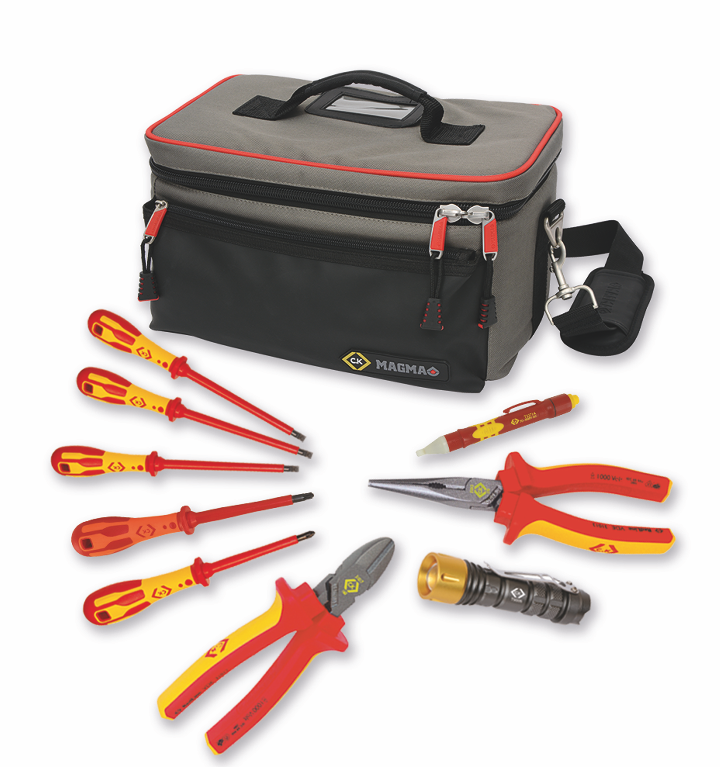 Removing the inconvenience of having to transport diagnostic testing equipment separately, the C.K Magma Test Equipment Case Toolkit combines the soft C.K Magma Test Equipment Case with a selection of tool essentials, including C.K dextroVDE screwdrivers, which feature all the most popular tip sizes, side cutters and snipe nose pliers from the C.K Redline VDE range, a C.K Non-contact Voltage Detector and C.K LED Hand Torch 100 Lumens. “Traditionally, soft padded and hard plastic cases are used by electricians to store and transport test meters. However, none of these provide space for the additional toolkit necessary for diagnostic and final certification testing, meaning electricians need to take a separate meter and toolkit,” says Charles Whitfield, product development manager at C.K Magma. C.K Magma undertook extensive research and identified that tradespeople require a made-to-measure storage option that included all of the essential tools required for diagnostic testing and final certification. The C.K Magma Test Equipment Case features rubber feet and adjustable padded compartments, designed to offer a safe storage place for testing equipment. A separate top compartment enables electricians to store a range of tools and accessories while 27 accessible pockets, including a business card and documentation holder, mean technicians can carry all the necessary tools and documents for diagnostic testing without the need for any separate boxes, cases or bags. A carry handle and padded shoulder strap have also been added to provide comfort during transportation and use. The shoulder strap allows technicians to carry out equipment testing whilst carrying the case, making the process more efficient. With a standard RRP of £187.29 ex VAT, the C.K Magma Test Equipment Case Toolkit is available as a Winter Wonderland 2017 exclusive at £99.99 ex VAT, a saving of 47% for the end-user.